"In Campbell's moving memoir, which doubles as a kind of extreme parenting guide, crisply detailed scenes are stacked with rural perils and pleasures, from treacherous canoeing, solitary fly-fishing and cabin building to grizzly bear threats and emotional nuance between a very loving parent and child." "One of the reasons we read books like Braving It [is] to experience what we may never have the particular courage to and share the terror and thrills of those who do....And Aidan is exceptional, choosing to ditch friends and devices in order to rough it. It is invigorating to meet a young woman hellbent on self-sufficiency, to watch her twist the head off a just-shot caribou and bop around the campsite, bear bells jingling around her neck....Mr. Campbell has set his daughter on the hero's journey and offered her the inviolable obligation of the parent: to show his child that she needs to save her own life and that she can." "It's a funny and emotional story. But why put your daughter--and yourself--at such risk? Because Campbell, who spent time himself as a teenager in Alaska, knows that nothing teaches you more about life than wilderness can." "Campbell's prose captures both the difficulties and pleasures on offer in the extreme wild... Parents who enjoy Campbell's adventures vicariously might find themselves contemplating their own family outing." "James Campbell describes ... trips to Alaska, where father and daughter faced off with grizzlies, battled clouds of mosquitos, capsized in a freezing river--and pushed the bond between them to its limits." "Braving It is a detailed portrayal of terrain so harsh it would give any seasoned outdoorsman pause, complete with grizzlies, brushes with hypothermia, and a growing bond that is honest, hard-earned, and touching." 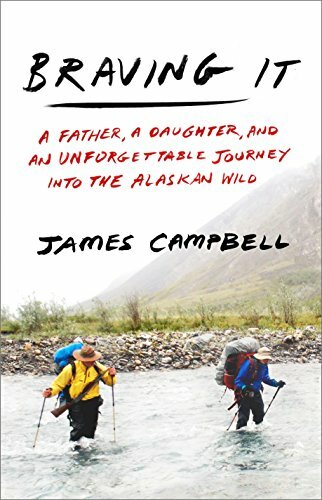 "Campbell, through his descriptions and thoughtful reflection, brings to life the Arctic's great beauty, expanse and values as a wilderness and testing ground -- a 'final frontier' for a certain kind of seeker... Braving It is a smart, insightful book that should be read by fathers and daughters everywhere -- and by anyone who looks to wild country as 'part of the geography of hope.'" "A touching and riveting true story of hope and adventure." "[Campbell's] daughter, Aidan, [is] worthy of a book-length tribute....Braving It [is] as much about parenting as it is about adventure, though in Campbell's book the two concepts are often inseparable." "With humor and honesty, Campbell brings readers along for the adventure, which is full of swarms of hungry mosquitoes, the fear of grizzly bears, and the push-pull relationship between a teenage girl and her father... Campbell expertly blends facts on the flora, fauna, and general life in the Alaskan bush with his reflections on being middle-aged, with many adventurous years behind him, as opposed to his daughter, whose quest for adventure has only just begun. Informative, humorous, and full of a love of nature." "A delightful and sometimes harrowing tale of the Alaskan bush." "Some parents will doubtless think the adventure James Campbell took his daughter on was irresponsibly dangerous or just plain crazy. But as a father myself, I'm in envious awe of the bold decision he made and the clarity with which he made it. As Braving It poignantly demonstrates, there is no better teacher than deep wilderness. Here is the essence of good writing--and good parenting, too." "Braving It, the book, is a metaphor for the wilderness--the call of the wild--that James Campbell evokes in this masterfully told story. Every time I set the book down, I pondered the lessons learned, and couldn't wait for my next sojourn into its pages. When it ended, I longed for the adventure to continue and pined for the beauty of Alaska. So I picked it up and read it again, savoring every page." "Braving It--tender, wise, translucent--is not just an Alaskan classic, but a parenting classic. I read it with great fondness, hunger, and a deep satisfaction." "This is a guide book for the heart, step-by-step instructions on how to fall in love with Alaska--the hard work and fear, the thrilling adventure and awe. Along the way, we are given an honest and touching portrait of a middle-aged man coming to terms with his own limitations even as he learns to set his adolescent daughter free from the confines of childhood. A wonderful book for any mental traveler who has yearned to experience Alaska." "Any of us who've watched daughters grow up to be strong and capable in the backcountry will delight in this book--it's a wonderful new world in many ways!" "In this wonderful book, James Campbell and his teenage daughter set off on a great adventure to one of the most beautiful, and often perilous, places on earth--the Arctic wilderness of Alaska. They face many challenges--whitewater rapids, grizzly bears, bone-numbing cold--but none as daunting for Campbell as guiding his daughter across the great divide between childhood and maturity. Set against a primal landscape of mountains and fast-flowing rivers, Braving It is as simple and powerful as any fairy tale." "As a father of daughters and lover of adventure, I found Braving It to be spot on--riveting, profound, open-eyed, and deeply touching. 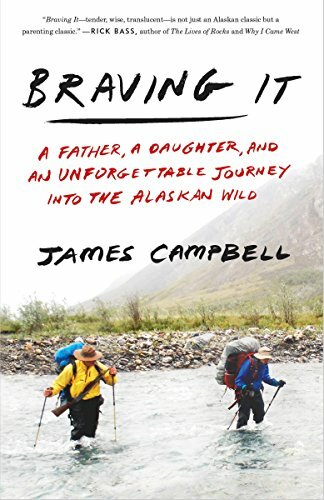 Campbell's struggle to understand and measure up to the stark and stunning Alaskan wilderness and, more importantly, to his teenage daughter--to find his place in the lives of both--becomes our struggle, too. A must-read for every striving parent and every teen striving to understand his or her parents." "Braving It is a beautiful and original book, an antidote to the screenification of modern life. As a father enters the country of middle age, and a daughter edges toward adulthood, they share an epic Alaskan adventure. Among the dangers they encounter is an unexpected one: fleeting time. Countering this is the gift the father gives the daughter and the writer gives the reader: the gift of the elemental now, of moments of wind, fire, water, snow, beauty. And of equally primal moments of human love and connection." "If your idea of a good time is hordes of mosquitoes and wind chills of 50 below, you are not your average dad. And if you invite your teenage daughter to enjoy these with you and she says yes, she may not be your average daughter. This is a great story of what it means to love, trust and test your kids." "Braving It is a book full of hope. At a time when we are concerned with ravages upon the environment, this story explores the wonder and unspoiled beauty of the Alaskan wild. And at a time when our youth are consumed with technology, social media, and a sense of entitlement, we read about a teenage girl who not only chooses to venture into the wilderness, but relishes the experience. This book gives me hope for our landscape and our youth." "Rarely has a book captured so well the unknown wilderness of parenting, of what it is to be a teenager and what it is for a father to learn to trust. Braving It is also a kind of guide to stepping outside one's comfort zone. A must-read for anyone trying to understand the father-daughter bond and anyone who loves wildness." "Braving It is part call to adventure, part coming of age story, and part celebration of family. A thoroughly engaging and thought-provoking read."